Empiral Multiplayer is a wad file that improves SRB2 multiplayer by adding some common features that were derived from other multiplayer games by using Lua scripting. 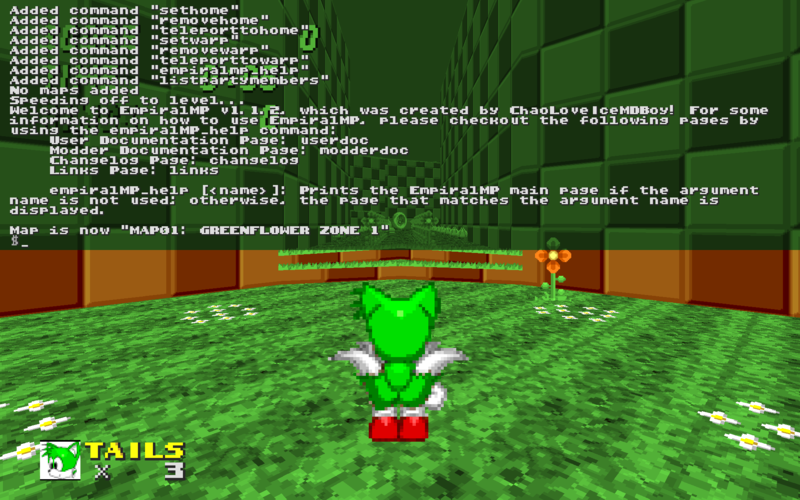 It adds chat rooms, parties, and clusters to Sonic Robo Blast 2, which are very useful for many purposes. You can even teleport to your home if you have it set, and if you don't want your home anymore then you can remove it also. Any suggestions for this multiplayer mod would be great. Also, please read the user or modder documentation to help you, and if that doesn't fix the problem you're having then you can either private message me, or post in the comments. The user documentation is used by everyone, while the modder documentation is used by modders only. EmpiralMP only works in netgames. Homes, and warps are disabled in ringslinger gametypes, and nights mode. Pressing Custom 1 spawns an edible cake, and pressing Custom 2 eats a cake if you are looking at it and gives you 50 points. cvar in Lua, you must use empiralMP.cvars.empiralMP_mode.value. Only the server or admin can modify this variable. Information: Prints the mod title, which you must modify if you want to make a mod based off of EmpiralMP. Information: Changes the player's active chat room, which is by default the Global Chat Room. party. You can alternatively use the empiralMP.client.CreateParty function to accomplish the same thing if you want to have a party that lasts for eternity. make the player join the party that matches the alias that you used in the changeparty command, unless you are already in that party or it does not exist. If it is a private party that you are trying to join, then you must have an invite from the party host; otherwise it won't be able to join that private party. Information: Invites a player to your party if you are the party host; otherwise, this will do nothing. Information: Mutes a player that is currently ingame, which makes that player unable to chat. Only the server or admin can use this command. Information: Unmutes a player that is currently ingame, which makes that player able to chat again. Only the server or admin can use this command. Information: Sets a home to your current position so that you can teleport to it later on. Information: Deletes a home so you can no longer teleport to it. Information: Teleports you to a home if you have a home set with that name. Information: Sets a warp to your current position so that anyone can teleport to it later on. Only the server or admin can use this command. Information: Deletes a warp so that noone can teleport to it. Only the server or admin can use this command. Information: Teleports anybody who uses this command to a warp if a warp with that name does exist. Information: Prints the EmpiralMP main page if the argument name is not used; otherwise, the page that matches the argument name is displayed. Information: Prints a list of the party members in your party. Use /color=colorname while chatting to use colored text. Information: Checks if the player is moving around. This function will return true if the player is moving around; otherwise this function will turn false. Also, if the player is not ingame, then this function will return nil. is the name of the function for this chat room that is inside the empiralMP.client.chatroomfunctions table. party. You can also use the createparty command ingame to accomplish the same thing as using the empiralMP.client.CreateParty function in Lua. Information: Checks if the server is dedicated. This can be useful if you want to allow better dedicated server support for your Lua scripts. with the player_t argument. After you create the function for your cluster, you can do whatever you like in it as long as you follow the rules of SRB2 Lua. A cluster number of 0 equals no cluster, which is the cluster number that is used by default. There are no known bugs in EmpiralMP v1.1.4. Please just call me Zappy. I should make multiple tutorial videos on EmpiralMP since just one video would last way too long, because EmpiralMP is pretty complicated. I thought about rewriting EmpiralMP in v2.0 after v1.2.0.0 got cancelled, but I decided to permanently discontinue EmpiralMP due to both personal and public lack of interest, and how badly the features were implemented. These features were not very modular and user-friendly and were the main reasons for EmpiralMP's failure.